"Part of... the concept of... this coat and... some of the other costuming is... that the characters, the guest characters, start out as land mammals and slowly they become whales." 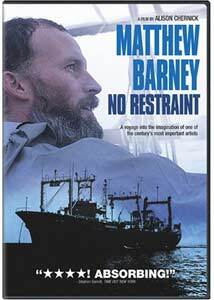 In November 2004, filmmaker Matthew Barney embarked on a Japanese whaling vessel called the Nisshin Maru to film Drawing Restraint 9. The latest experimental opus from this renowned artist/filmmaker, Barney brought along his wife, the singer Bj�rk, a group of Japanese "extras," and his crew to shoot footage that defies explanation. The result is a motion picture that has yet to be released on DVD, and is only occasionally screened in select venues around the world. Barney has even stated that he will never release the film on home video, so its footage in Alison Chernick's documentary, Matthew Barney: No Restraint might be the most that the majority of filmgoers will ever get to see of it. Matthew Barney is a former college football quarterback who began his career as a male model, but eventually branched off on his own, crafting odd sculptures, and even odder films. While best known for his Cremaster Cycle, Barney has been obsessed with filming sequences involving the resulting impact of self-imposed limitations. Drawing Restraint 1-8 are a series of short films showing him in these various situations, while Drawing Restraint 9 takes this study—his obsession—to the next level. Chernick's film crams quite a bit of information into its 71 minutes, but it's nice that equal time is spent on both Drawing Restraint 9 and Barney's career as a whole. This excellent documentary will have you clamoring to see not only the rest of the Drawing Restraint series, but Barney's equally hard to find Cremaster Cycle as well. A collection of incredible on-set footage for both projects gives us a great look at the method to some of Barney's madness. As a die-hard fan of the genius that is Bj�rk, it's great to see quite a bit of time spent on her beautiful score. So underappreciated for the film work she's done in the past (namely, the Oscar-worthy performance in Dancer in the Dark), the Icelandic sprite is completely in her element here. We see her in the studio composing the score, as well as in interview footage where she discusses her influences and working with her husband. This pair exhibits quite a bit of natural chemistry, which we can assume comes through in the actual film. There's also none of the inherent disagreements that occur between a husband and wife, regardless of the situation. An instance even occurs where Bj�rk disagrees with a line delivery and Barney seems to take her criticism and suggestion to heart by allowing her to improvise for the next take without any visual displeasure. A great addition is footage of the first-ever screening of Drawing Restraint 9, which took place in Japan. We hear from Japanese audience members who are puzzled by what they just saw, but appreciate how Barney has taken on Japanese culture and provided a unique yet respectful view of it. Chernick teases us with what Barney has to offer as a filmmaker and absolutely leaves us wanting more, making her documentary all the more compelling. It's fascinating to see a former college football star now making molds out of Vaseline on Japanese whaling boats and simulating human disembodiment. If only a wider audience had the ability to immerse themselves in his warped vision. Image Transfer Review: The 1.85:1 anamorphic widescreen presentation is as sharp as can be expected given the variety of footage that's been compiled. The image is cropped for most of the clips from Barney's films, yet the images are mostly sharp and detailed. The location footage is surprisingly impressive as well, with shadow and contrast levels consistently strong. There's the inherent grain that comes with a documentary shoot but otherwise print problems are kept to a minimum. Audio Transfer Review: A Dolby Digital 2.0 audio track services the proceedings well, especially during the time devoted to Bj�rk's music. This mix makes liberal use of the surrounds and features some nice bass, while the dialogue is always easy to hear and understand. Extras Review: There are two extras, the first an interview gallery featuring Matthew Barney talking about his early inspiration, as well as details about his various films. There's over 18 minutes of discussion, including Bj�rk's musings on Japan. The other extra is a pair of "Time Lapses," which focus on the construction of the Vaseline tub at the Brooklyn Site and in Japan. For the time being, the documentary Matthew Barney: No Restraint is the closest we're going to come to seeing the feature film it chronicles. Fortunately, this is a fine piece, perfectly blending the study of Barney's career with that of this specific experiment. IFC's DVD never falters in the audio and video departments, and includes ever more interesting footage masquerading as supplemental features.